What were supposed to be ‘transitory spaces’ for Palestinians after their displacement 60 years ago, have become ‘sustainable temporary’ living spaces. These spaces, the camps, even if infinite, are to others ‘non places’, to borrow Marc Augé’s term. In Lebanon, with all of the connotations and labels that surround them, there is an ever increasing lack of communication between the inhabitants of these refugee camps and those of the surrounding city. I am interested in the effect that this constant state of flux has had on the daily lives of the inhabitants of these camps. This lead me to map the transitory objects that are used in and around the camp of Shatila in Beirut, and to consider the ubiquitous cart as an object that could potentially, both literally and metaphorically, be used to cross boundaries and hopefully create new paths of communication between these spaces with the city. In its journey, and during its stops, the cart is able to construct informal social spaces allowing for the act of creating, folding and unfolding of personal narratives from the two sides. This is an attempt to highlight and acknowledge the value of those lives, and open up to what really exists between those borders that we demarcate in our cities. 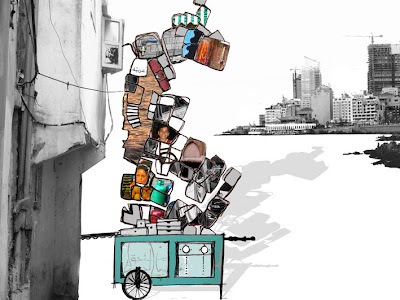 mapping its route across streets of Beirut..
collecting stories during the show..